The Villa is a 10 minute drive from the Protaras strip, Pernara is 5 minute drive, as is Kapparas. Buses run every 20 minutes throughout the day/ night. If you are looking for an idyllic location, love the sun, sea, sand and want to get away from it then look no further. On the exclusive Mediterranean coast with the beach a 3 minute walk away. The Villa is on a huge 275M2 South facing plot and is fitted with modern contemporary furniture, and has WiFi. It can accommodate up to four people comfortably and is ideal for families. If your idea of a perfect holiday involves escaping the crowds, enjoying a glass of wine while watching the sunset, relaxing by the private pool (7.5 x 3.5M) and having romantic dinners, then this Villa is for you. If you are searching for privacy, relaxation, the opportunity to enjoy the sunbathing poolside or activities such as cycling or nearby water sports, then you have found the right place. The Blue Flag beach is 250m away, with local tavernas, pubs and supermarkets within a 10 minute walk.. Famagusta Sailing Club is adjacent to the Beach. Cat and dinghy hire is available. Wheelchair access from beach into water. Conditions: Air conditioning included in rates. Rental rates: Rental prices are quoted in British £'s. The main1st floor bathroom is fitted with a spacious shower, WC and wash hand basin. There is a convenient ground floor WC fitted with a wash hand basin. An outside shower is adjacent to the swimming pool. The villa is not wheelchair accessible, howeverTrinity beach (3 minute walk), has a 'Sealift'. This enables anyone who has limited mobility to easily transfer in an out of the water. See photos. The property is located on a huge plot of 275 M2 the plot space is South facing therefore has the SUN all day. There is a gas BBQ, 4 sunbeds and a patio table with comfortable chairs and parasols. Located on the main bedroom balcony are a table and chairs for breakfast overlooking the Med. Satellite TV with DVD player in the Lounge with a CD system fitted. Six chairs are provided to the Dining area for any friends that drop by. The kitchen is fully fitted with microwave, oven and hob. There is also a separate wine cooler and upright fridge freezer. The swimming pool is cleaned regularly, two to three times each week. Very smart property, located close to a very nice beach . Good service from the local manager. Local property manager very helpful. Pool cleaned regularly. Some, now minor building works being completed near the villa. The beach is perfect. Impressed by the villa & location. Good communication with the owner. Would retun next year. Excellent holiday for all my family. Exactly as described. Great stay. Was very impressed with the quick responses from the time of enquiring about the property, when we booked the villa and during our visit and how accessible David was. Very helpful and good instructions and map provided prior to trip. Villa was ideal for our family (2 adults and 1 teenager). Clean on arrival and everything as listed from website. Pool and area again clean on arrival, pool was also cleaned during our stay by a very pleasant chap. Outside area large space and has plenty of shade and seating. Aircon and fans a blessing in the heat and not complicated to use. All white and brown goods available just like home from home. Fridge and freezer nice and big for plenty of food. Bedrooms good sizes. 2 min walk from lovely beach. We hired a car which we really benefited from but plenty of shops just up the road (great bakery). The property was excellent with great facilities and really good local restaurants + shops - it has spoilt us completely as we are now focussed entirely on villa holidays. Have knocked off a star because of the local building works but in truth we always went to the beach so missed all of that. The owner David was very receptive to email communication and when we did have a problem with air conditioning it was sorted out quickly and effectively. I have thoroughly enjoyed my stay at the villa with my two grandchildren. I was however somewhat concerned prior to our arrival with regard to the previous review. However in my experience the villa was spotless and the children lived in the pool. We also loved the unspoilt safe beach three minutes walk away. Whilst they are building villas next to the villa this did not affect us whatsoever. In fact the children were extremely interested as to how they build villas in cyprus. We are only upset that we did not book for longer. I would certainly recommend the villa to my friends and family as the location is great. We shall hopefully be returning next year. After the previous negative review! It's nice to get a review that the villa and location deserve. Thank you. Airport transfer can be arranged if required. This will be pre-booked for you and is payable upon arrival. Ayia Triada In south Cyprus is on the outskirts of Protaras. The Villa is one of a private development of only six Villas. The Villa is on a huge plot and is on a small road that leads to the beach and fishing port. The private pool is 7.5 x 3.5M. The rear of the property is South facing and has the Sun all day.Restaurants and bar's are about 10 minutes walk away in Kapparas. Pernara is 5 minutes by car, Protaras tourist centre is 10 minutes. All along this coast are beautiful beaches and coves which are ideal for diving and snorkelling. 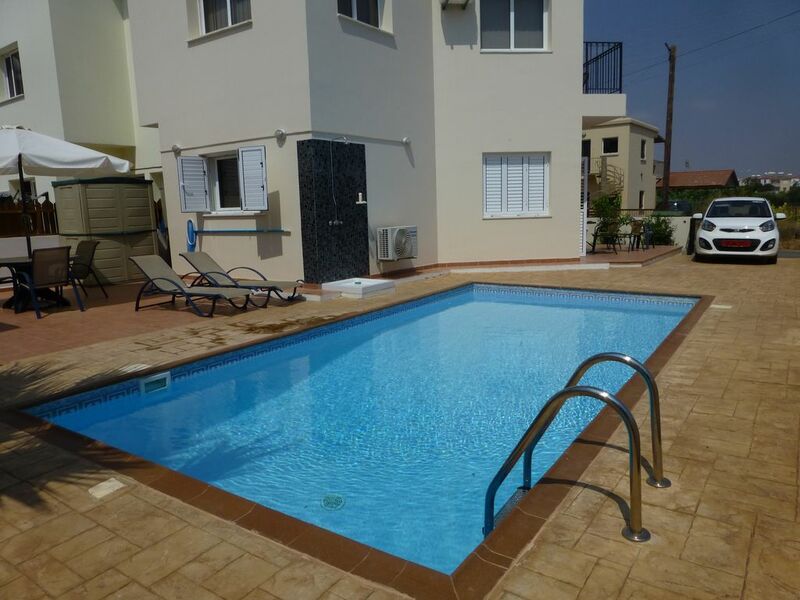 The property is near to the local bus route which travels through all the resorts in the area and on to the Water Park at Ayia Napa. In the other direction the bus goes into the nearest town of Paralimni. This is a traditional Cypriot town with supermarkets, shops, banks etc., as well as tavernas and coffee shops. A car is not essential at this property and taxis are very reasonable. However competitive car hire is readily available. A £200.00 non refundable deposit is payable at time of booking. The security deposit will be returned within 28 days of departure provided keys are returned and there is no damage to the property and/or fixtures and fittings. The Villa will be fully cleaned prior to your arrival and after departure. Fresh bed linen and towels are provided for the Villa but please bring your own beach towels. Departure day day checkout time is 10.00AM.